Nidorino in game: 741 Who? Important notice! Pokemon Nidorino is a fictional character of humans. He evolves from Nidoran♂ starting at level 16 and evolves into Nidoking when exposed to a Moon Stone. 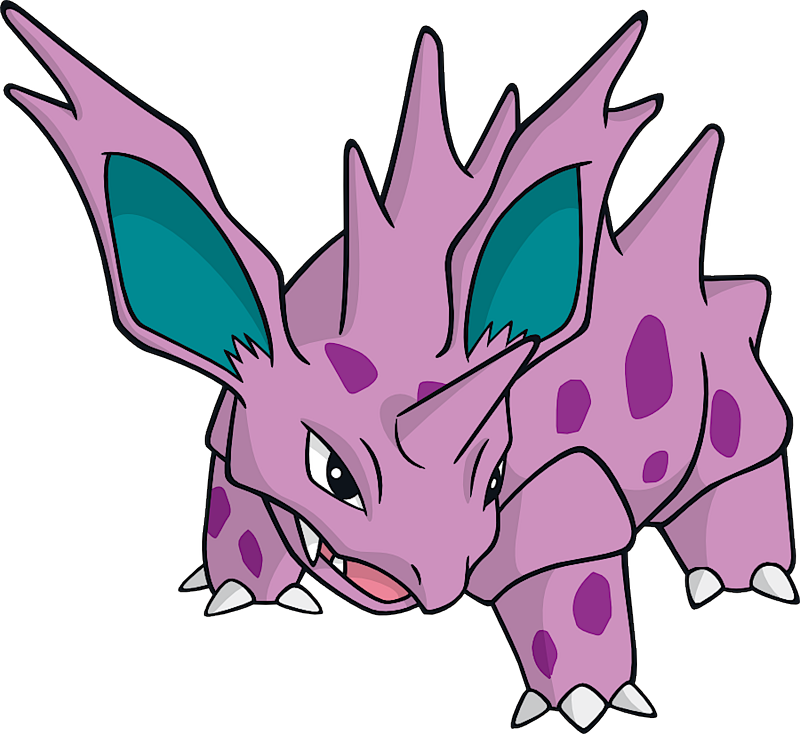 Nidorino is a light purple, quadruped Pokémon. It has several darker purple spots across its body. It has large, spiny ears with teal insides, narrow black eyes, and a long snout with two pointed teeth protruding from the upper jaw. It has a ridge of toxic spines on its back, and a long, pointed horn on its forehead. The horn is harder than a diamond and capable of secreting poison on impact. Its short legs have three claws on each foot. 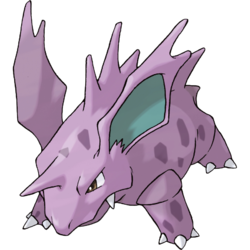 This is a male only species; the female counterpart is Nidorina. A Nidorino appeared in the first episode, battling a Gengar in a battle Ash was watching on TV. Nidorino along with Gengar were the very first Pokémon to be seen in the anime, not counting the intro. Ash battled a Nidorino in Fire and Ice during the Pokémon League. 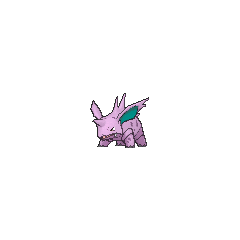 The same Nidorino reappeared in a flashback in Friends to the End. 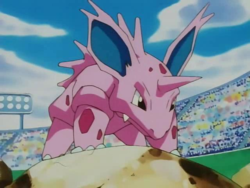 Ralph's Nidorino appeared in Wherefore Art Thou, Pokémon?, having evolved from a Nidoran♂ after the battle with Team Rocket and after kissing Emily's Nidoran♀. Temacu has a Nidorino which was first seen taking a stroll with her Nidorina in The Heartbreak of Brock. Several Nidorino were in the race shown in The Flame Pokémon-athon!. A Nidorino also appeared in the banned episode EP035. A Nidorino made an appearance in The Breeding Center Secret. A Nidorino appeared in Mewtwo Strikes Back. A Nidorino was seen at Professor Oak's Laboratory in A Tent Situation. A Nidorino was one of the Pokémon seen at the Pokémon Swap Meet in Tricks of the Trade. Two Nidorino were seen in the wild in The Legend of Thunder!. Multiple Nidorino appeared in the opening of Destiny Deoxys. 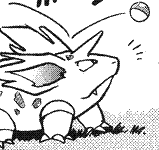 Nidorino also appeared in Arceus and the Jewel of Life. A Nidorino appeared in the opening scenes of Zoroark: Master of Illusions. 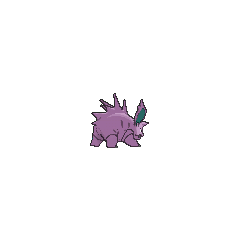 A Nidorino appeared in SM003, as a silhouette. 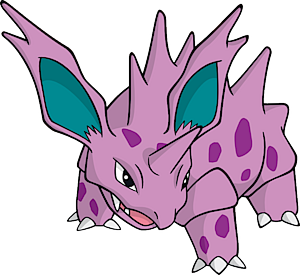 A Nidorino appeared in the opening sequence for The Adventure, battling against a Gengar. Nidorino and its pre-evolution share their category name with their female counterparts Nidoran♀ and Nidorina. They are all known as the Poison Pin Pokémon.